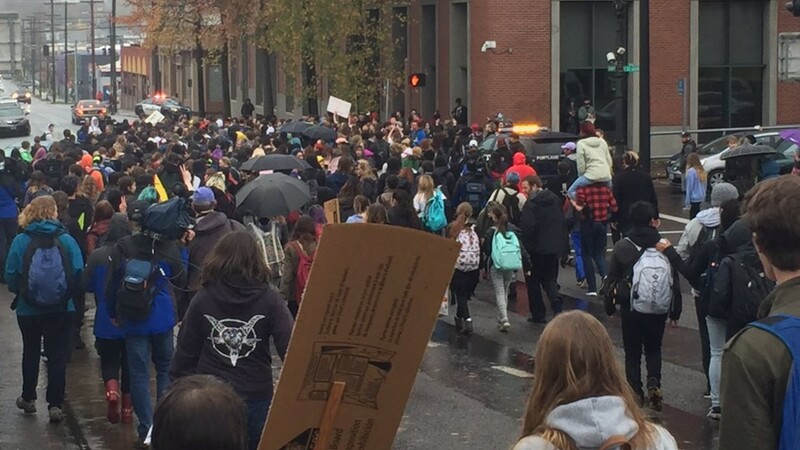 Hundreds of Portland area students walked out of school Monday to protest the recent election of Donald Trump. PORTLAND, Ore. -- Hundreds of Portland area students walked out of school Monday to protest the recent election of Donald Trump. The move, which started at Pioneer Courthouse Square and moved to City Hall follows a tumultuous week in Portland, with nightly protests that included some violence and rioting and more than 100 arrests. There were no arrests, no injuries, no violence in the student-led protest march. Students from at least seven different schools illegally blocked traffic, but with no real parent or teacher supervision -- police worked with the kids, blocking streets temporarily to traffic in order to keep them safe. About 100 students appeared to be participating. After spending about 30 minutes demonstrating at Pioneer Courthouse Square, the group headed to Portland City Hall. Some of the students are as young as 12 years old and came out by themselves. "My mom, she kind of thinks it might be dangerous for us to be out here, but we're proving we can reach out and tell people how we feel," said Pam McKelwen while gathered at Pioneer Courthouse Square. The students said they're impassioned about this election, but not destroying our city or tearing others down to make their point. One student organizer told kids over a loud speaker: "We are here to tell the adults and to people who actually voted in this election, Portland Public schools does not stand with racism, we do not stand with sexism and we do not stand with Islamaphobia." One mother chaperoning her 12-year-old son said missing one day of school isn't as important as this. "I think it's really important for them to learn how to express themselves and voice their opinions. We've also had lots of talks about after this what he and his friends can do to organize themselves," said mother Rachel Mitrani. There wasn't a real plan, so the kids stopped traffic to amble over the Hawthorne Bridge and wound through side streets of inner southeast. Police walked along with them, blocking streets to keep them safe. As the protest found its way to Benson High School, kids in class quickly lost interest, coming to the windows to see what was going on. The group assembled on the lawn out front chanting, "walk out," and some students did. Most all of these students are too young to vote. They said this kind of protest is their vote. "It has come to our attention that students from a number of our middle and high schools are planning a walk out today at 9:50 am. Portland Public Schools recognizes the right of students to demonstrate regarding their beliefs and concerns. However, we believe that the safest place for students is in school engaged in their classes. • Please be aware that high school students who do choose to walk out will receive an unexcused absence. • All K-8 and middle school students will be instructed to remain in class unless checked out by a guardian. • Also, staff will not be participating in or overseeing walk outs since these are not school-sponsored activities. Students leaving school will not be chaperoned and will be responsible for their own safety." On Friday, students walked out in protest from Woodburn High School. Other protests have been happening at schools around the country since the election.